The term Brand Ambassador has a nice ring to it. It rolls off the tongue. Sounds official, but not pretentious. Evokes the notion that the bearer of the title is “in the know.” And doesn’t this sum up blogging? Bloggers know what is happening. Bloggers may not know EVERYTHING but if it fits the blogger’s niche the blogger will know about it…I can assure you! Last year I was chosen to be a Purex Insider. If you were reading my blog back then or following me on twitter or Facebook, you may have noticed I wrote about Purex Complete 3-in-1 Laundry Sheets. This “All-in-one Laundry Solution” worked for my family’s laundry needs. I used 1 sheet for the washing and drying. The sheet was also a fabric softener. No mess. I stocked up my laundry room with Purex Complete 3-in-1 Laundry Sheets using free coupons. Go to Purex.com to find more promotions for free products. This year I am reprising my role as a Purex Insider for Purex Crystals. According to the Purex website, “Purex Complete Crystals™ Softener are 92% natural crystals that go in at the start of the wash so they spend more time with your laundry infusing them with long-lasting freshness.” I was sent a sample to try…very sniffy! I have coupons for you and a contest! You can find videos featuring Purex research scientist (and mom) Dana at purex.com. 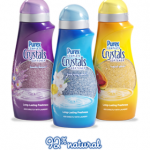 Purex reps have told me that they hope the videos will help consumers understand the drawbacks of oil based softeners and the advantages of 92% natural Purex Complete Crystals. As a Purex Insider, I’m part of the first Purex Insider competition to see which blogger can drive the most traffic to the Crystals web page on Purex.com. Want to help me win? I have coupons to offer you…go here to download and print. If you want to, you can tweet, post to Facebook, or blog about this contest to help me win. The contest will run for two week ending at midnight pacific time on Sunday March 13th. Thanks to everyone who helps me win this contest! I was sent a sample bottle of Purex Complete Crystals. The opinions expressed in this article are my own.